You've heard a lot about the importance of construction daily reports. There's no downplaying the importance of the photographs that accompany them, too. The human brain comprehends and remembers visual images more readily than written ones. Properly curated and used images can be an important part of all types of reports, from dailies to special ones prepared for shareholder meetings. These images can be progress photos, point out safety hazards, show that environmental issue that might delay a project, or unfortunately, be used as litigation evidence. In the good old days, photo documentation often consisted of Polaroids stapled to paper reports, which neither was too professional in appearance, or held up well over time. Once everyone figured out that whole pixel thing, digital cameras proved to be a boon for superintendents in the field, as these cameras' size and quality both improved with time. But despite these improvements, digitized photography still wasn't convenient. There was still a wait process as the construction supervisor (or a lab) had to transfer the images from the camera to computer for processing. Even after everyone began taking pictures with their cell phones, images still had to be transferred to a computer, and a new file had to be created and named. Moving these images from a photo file to incorporate with a text file could sometimes be awkward. Since this process often meant making trips to the office to do this, the result was an expenditure of time and money, and often a delay in completing reports. But with the advent of software applications, as part of daily reporting has become a great deal easier. Photo apps can help users organize, backup up and share both single photos and collections instantly, all using mobile devices. Take for example, the construction photo documentation software offered in Raken's app for daily reporting. When a foreman snaps some shots of the day's work using his phone, those shots automatically become part of the daily report. No looking for USB cords and struggling to manually transfer those images from one file to another. Not only does this save field photographers much work, a project manager or others in the office can immediately see those images in real time. Raken also incorporates these images into a newsfeed of daily activities, making it even easier to see how these images correspond to site activities. 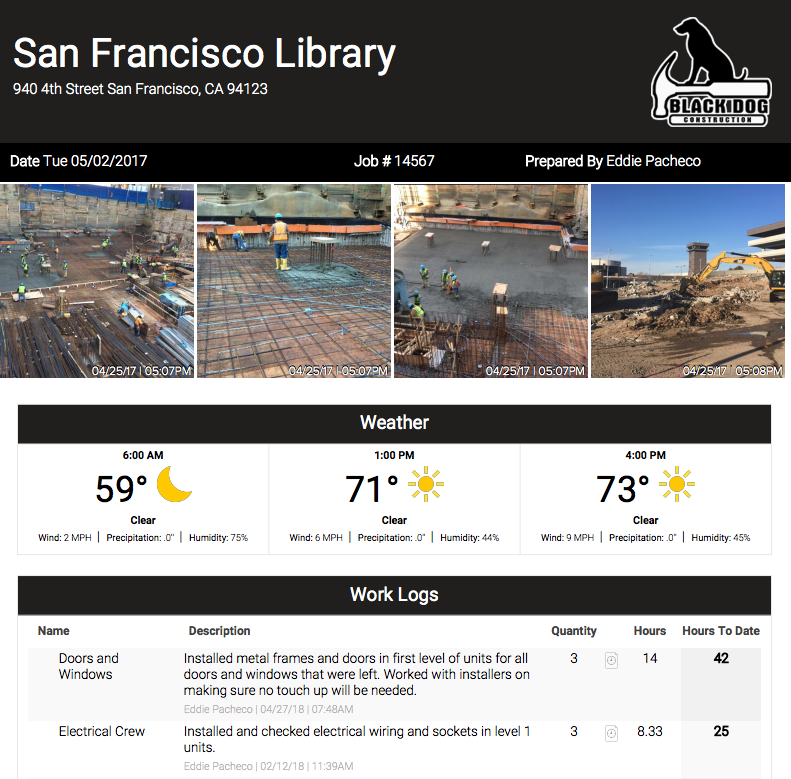 Raken makes life easier for a busy site superintendent with its Photo Gallery feature, which makes it easy for users to find, organize, and download photos, using their desired cloud server. This is especially convenient not just for construction management purposes, but when image files are shared from everyone from shareholders to attorneys in litigation cases. And as with all other parts of these reports, Raken stores images safely and securely online for up to ten years. So while these features probably don't mean that your project management team will be quitting their day jobs to become professional photographers, with Raken, they can be assured of professional, real-time images that enhance and protect the integrity of a firm's work.